Another New Comic Book Day is upon us! It’s time to plan out your next trip to your local comic shop and take a look at this week’s new comics! 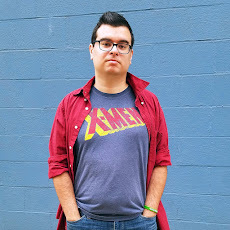 Hit the jump to check out mini-reviews of my favorite comics coming out this week. In a world where assassinations can be crowdfunded, the million dollar Reapr goal on Charlie Ellison’s head keeps going up. When the sanctity of her newly hired bodyguard Vita’s home is invaded and they have to find a new safehouse, they’re dragged through some dark corners and begin to uncover who started this campaign. After a whirlwind of guns and knives, this issue brings us some quiet downtime between our two lead characters (briefly interrupted by a smaller whirlwind of guns and knives) that explains a little bit more about who they are and how this all came to be. We first find out just why the hell Vita, a young freelance bodyguard, cherishes her weirdly hundred-year-old house - it was left to her by a client who refused to sell the land to a contractor. Vita keeps the house together to honor her memory. We also meet one of the “friends” that funded Charlie’s campaign. As expected, not everybody is a big fan of Charlie - even her friends. After just a few pages of the first issue, it was pretty clear why so many people would want her dead, but self-centered Charlie is finally coming to the realization for herself. A quiet discussion at the end has the two contemplating what defines “bad” and what causes them to become that way. It was a surprisingly sweet moment given the bloodbath that preceded it. We also get my favorite thing in comics: worldbuilding. In the last issue, I wondered how any of this Reapr business was legal. This issue explains that, but with so much detail it almost had to be a text heavy info dump. Essentially a full page of exposition should be a turnoff, but it’s beautifully framed as three teenage boys mansplaining to Charlie and Vita what they continue to ensure they’re already well aware of. The premiere issue of Crowded painted a caricature of our current gig economy of apps that do everything for us. This issue explores more of the social lives in the digital age with fake friends and know-it-alls. Come for the violence, stay for the heart! Every week I get these new comics and every week I jump into reading my favorite ones first. 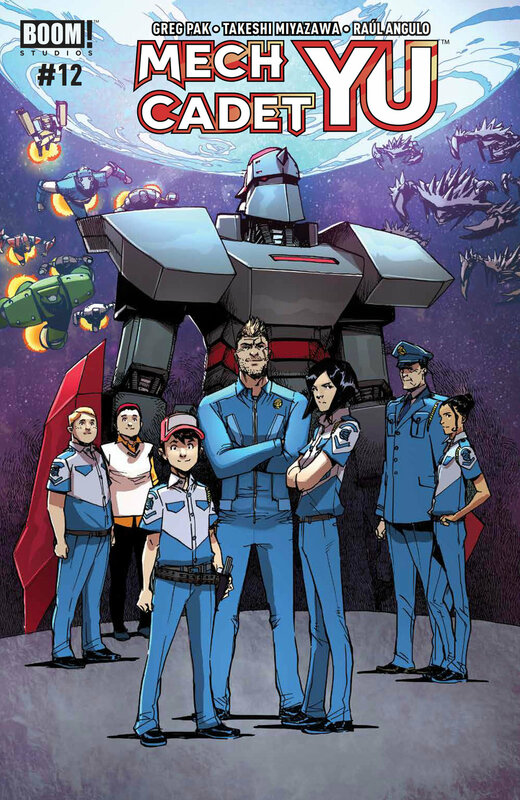 I’ve been in love with Mech Cadet Yu since I first heard its name and saw the cover of its first issue. This week, I put off reading its final issue until the end. Mech Cadet Yu has been one of those series that tugs at your heart. It’s all about the bond between the nicest, sweetest boy in the whole wide world and a robot that seemed doomed from the start. I knew from the beginning that this wasn’t going to have a happy ending. So, was I right or was I wrong? You’ll have read the final issue for yourself, but I will say that this has been one of the most emotionally satisfying comics I’ve read all year. It will be missed, but I’m looking forward to whatever the creators have in store for us next. I’ll have a full review of the entire series up soon. Every human left alive wants a piece of Nathan Bright—but there’s only so much of him to go around. Enter the Pearl, a crime lord in the business of making revenge as sweet a possible… and death last forever. 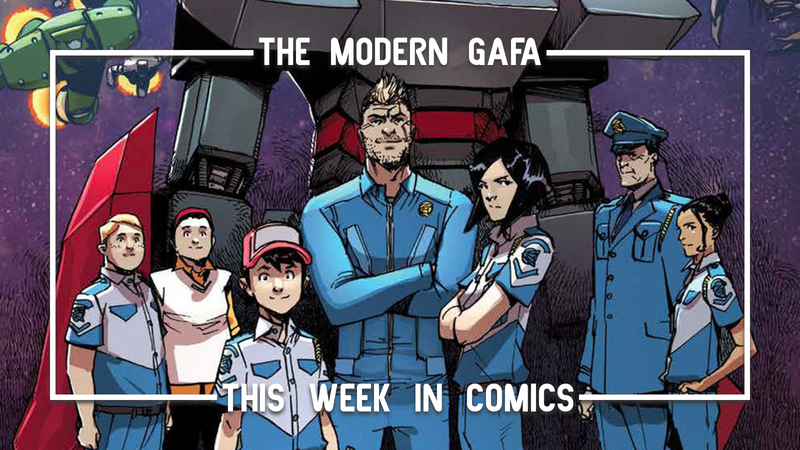 This zany and ultraviolent sci-fi series that feels like Total Recall turned up to eleven returns with an issue that’s a bit light on our titular weatherman. What we do get, however, is one of the most gut-wrenching scenes I’ve read in a comic all year. But first, some sad flashbacks to start your day! This issue opens on a dreamlike vision of the day the Earth was destroyed and gives some insight into the personal pre-apocalypse life of one of our characters. Touching moments like this one are rare in this tale of Martian mayhem. Weatherman is wild and bloody sci-fi fun that keeps getting better. Click here to pre-order the first collection. With their party split by two different kidnappings, this ruin hunt is off on all the wrong feet. Rex and Pogo -mostly Rex- have a plan that will get them back on the hunt for the treasure...that is, if they can survive this rest of the week. By this point, you should all know how much I love world building so it should come as no surprise that a dungeon crawling fantasy series about anthropomorphic animal adventurers is right up my alley. It’s a bummer that this is only a short limited series, but Derek Laufman proves every week that he’s going for quality over quantity with each issue. 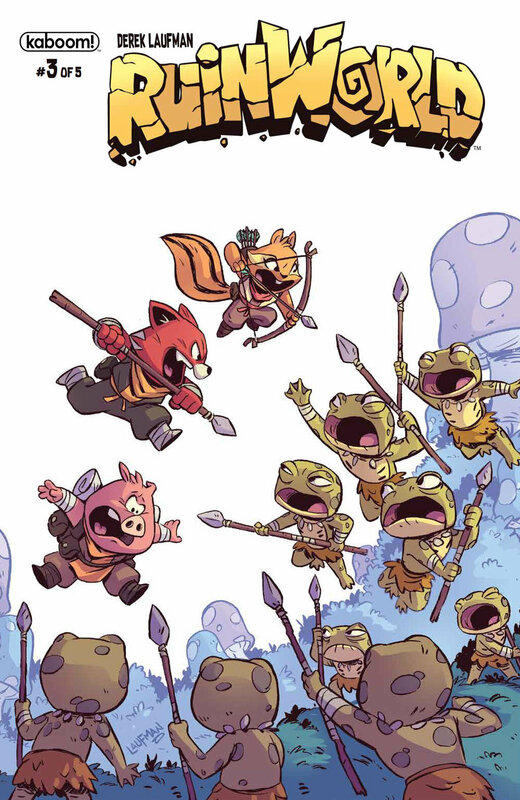 We finally get some lore and backstory for this beautifully drawn fantasy world as Pogo the pig finds himself captured by a tribe of frogs who are in an endless war with the fish people. I’ve said quality over quantity plenty of times in these reviews and here it really shows how well Laufman is able to introduce us to so much of the world and a large cast of characters in such a short amount of time. I never feel like there’s too much going on and I never forget who is who each month. Ruinworld may not be here for very long, but it’s already made a huge impact in such a short time. I really do want more of this world, but what we have so far is more than enough. Every page is densely filled with creativity, every panel crafted to perfection.